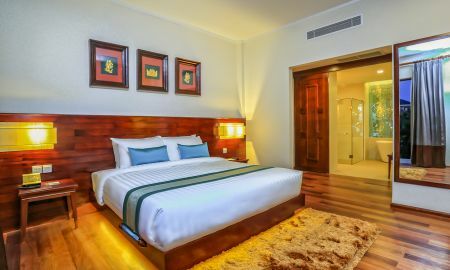 The Privilege Floor @Lotus Blanc is located right in the centre of the historical town of Siem Reap, on the first floor of the luxury boutique hotel of Lotus Blanc Resort. 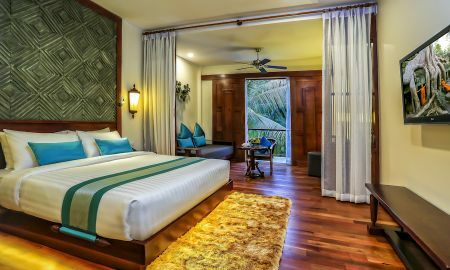 There are 23 Privilege rooms and suites inspired by French art and décor, delivering a unique experience in a Cambodian hotel. Make your stay unforgettable by enjoying exclusivity with tailor-made services on offer. The Le Blanc restaurant, in both an indoor and outdoor setting, serves authentic Khmer cuisines and international dishes in an open kitchen, allowing chefs to tempt your taste buds whilst showcasing their culinary skills. The Lemon Bar offers a trendy and romantic setting offering signature cocktails, outstanding wine and champagnes to choose from. Rated as one of the top three pools in TrustYou.com's survey of the best pools in the entire Asia Pacific region, the Olympic-sized pool is fabulous! Relax by the pool lounger as next to the outdoor pool is the bar offering a perfect oasis, surrounded by coconut trees. The bar creates a romantic ambiance and the tropical serenity that defines a warm and relaxing evening. Take the opportunity to use the fully-equipped fitness centre, or, at the Mudita Spa, rejuvenate with a pampering allowing the spa therapist to use the most popular traditional Khmer massages. Additionally, Wi-Fi is enabled throughout the hotel and there is free parking on-site. 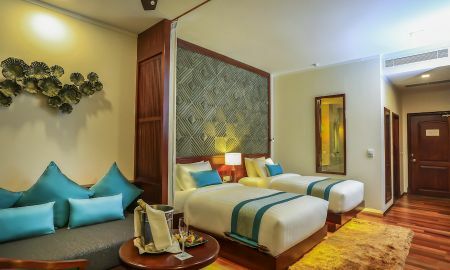 The Privilege Floor @Lotus Blanc is 12 Km away from Siem Reap International Airport and 7 Km to the renowned heritage site of Angkor Wat. Nearby is Siem Reap's Pub Street, Angkor Night Market, and other attractions within a 5 minute ride in a tuk-tuk.